For my mids and highs, I went with the Infinity Kappa 60.5cs. These are pretty affordable and sound pretty good IMHO. They are a component system, so it icludes a woofer, a tweeter, and crossover. They are the pretty much standard size of 6.5″. As you probably already know, the CC Titan comes equipped with 6″x9″ speakers in the front doors and 6.5″ speakers in the rear doors. So in order to fit a 6.5″ speaker in the opening left by the OEM speaker, a baffle or mount must be fabricated. 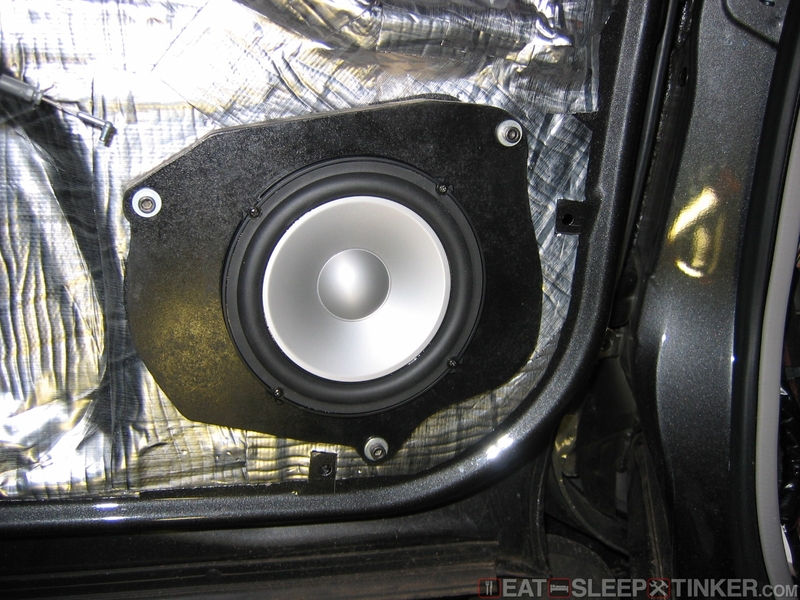 MDF mounts would be used for the rear speakers as well. Even though the Titan has 6.5″ speakers there, they use a proprietary mounting layout. 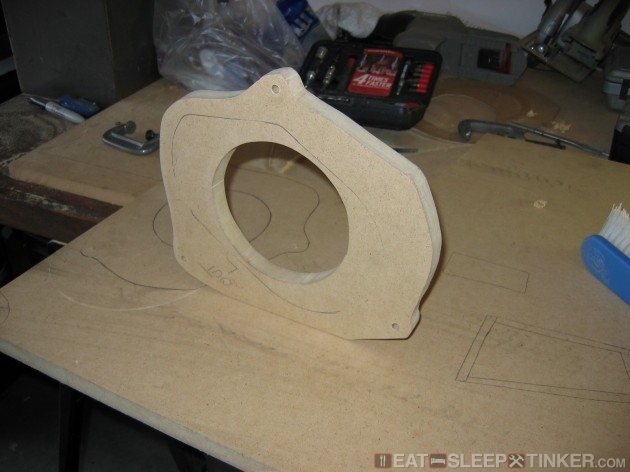 The other added bonus to making MDF mounts is that they provide a sturdy mount for high powered speakers. This cuts down on distortion, rattles, and resonance. The common and probably most effect way to do this is uring MDF. In order to come up with the proper shape needed for the front doors, I took the OEM plastic 6×9 mount and traced it onto cardboard. Then I transfered the template to the 3/4″ MDF. The correct size hole for the Infinity 6.5″ was cut in the center of this mount. The rear mounts were easier to make since the speaker location isn’t as confined. I simply cut a mount large enough to seal up the opening and line up with the factory speaker mounting holes. 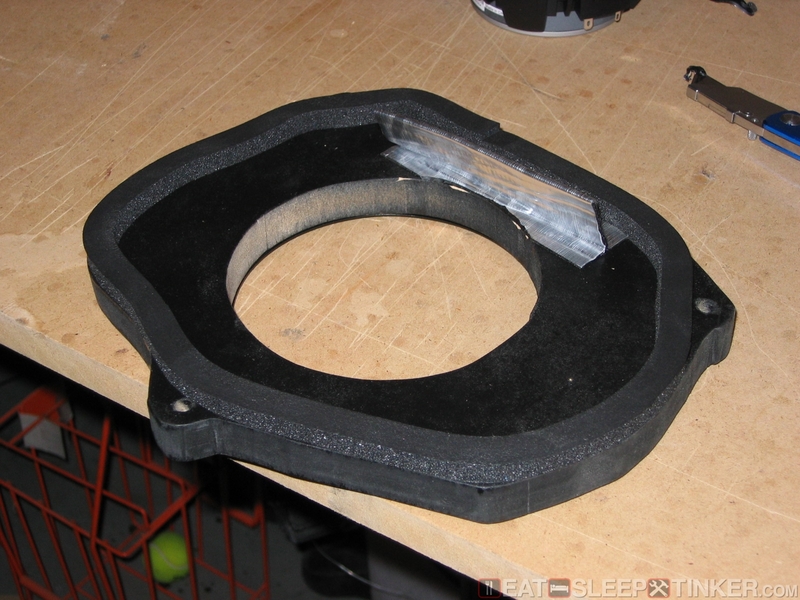 The final step was installing the Infinity steel mounting rings to the MDF mounts. Here you can see the bare mount right after cutting it. A few additional cuts were made in order for the door panel to properly seal up. So it isn’t an exact replica of the factory plastic mount. This is the final product ready for installation. The entire mount was painted with gloss black spray paint to protect the MDF from moisture which is present inside the door shell. Foam weather stripping was added to the back-side to help seal up the door. 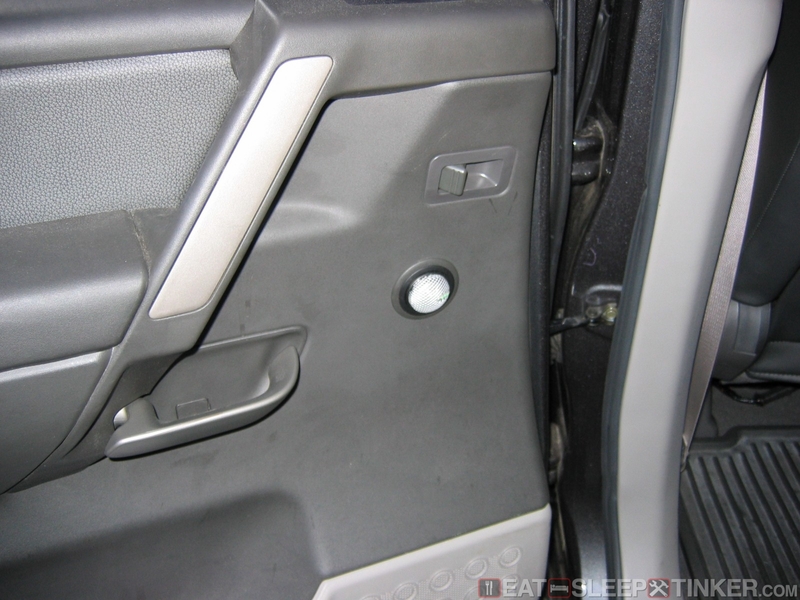 This is needed because the OEM door shells aren’t completely flat. A small tab made from bquiet mat was placed on the back to give some protection from the possibility of water draining down. The factory speakers are mounted to the metal doors with bolts going into a somewhat tapped hole. These screws wouldn’t be long or strong enough to mount the MDF boards. So I bought some 1/4″ allen head bolts (sorry I don’t recall the length), flat washers, and nylon locking nuts. The factory holes were opened up a bit with the drill. The MDF mounts were then secured to the doors using the mentioned bolts, washers, and nuts. They were torqued until the foam weather stripping was completely compressed and the mount was flush with the door. 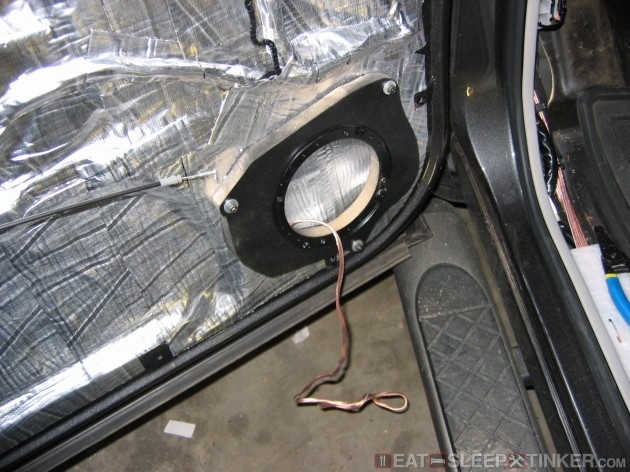 Following that, the speakers were wired in and installed. 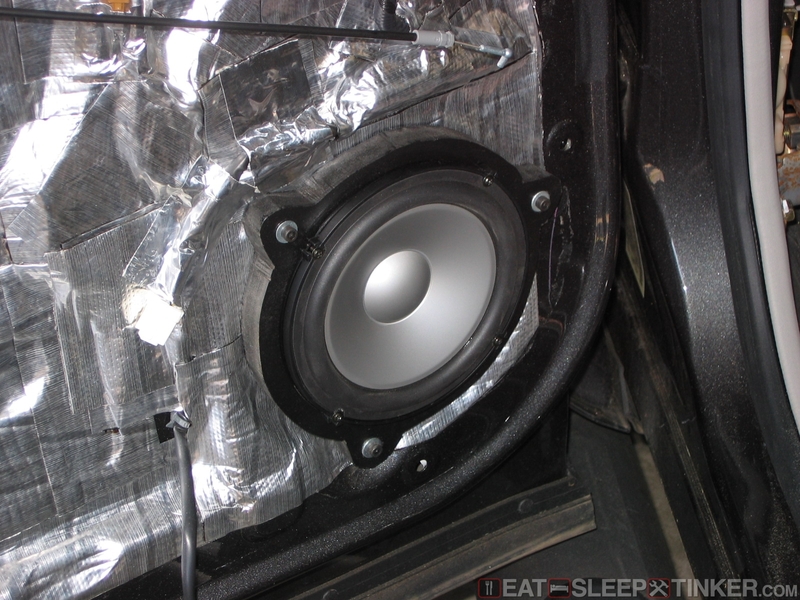 The front left speaker installed. 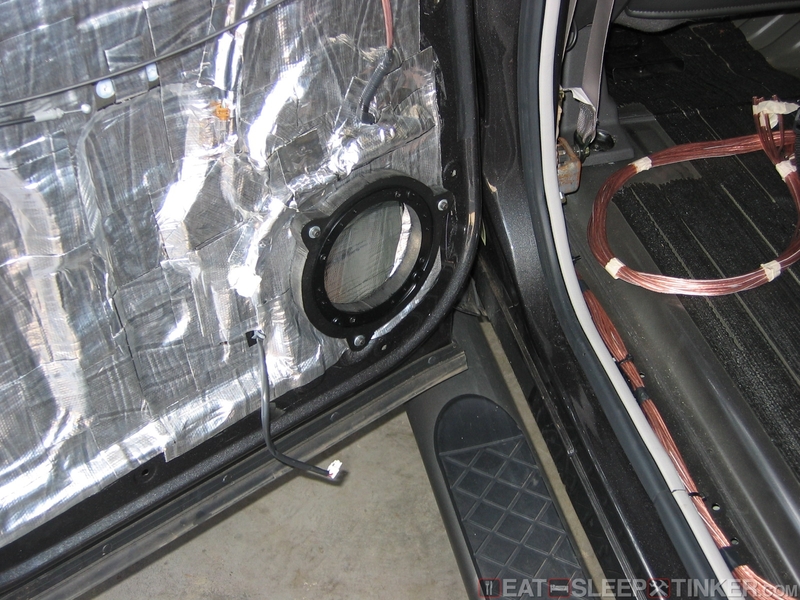 The left rear speaker installed. Tweeter Installation NOTE: I have replaced the Infinity Kappa metal dome tweets in the front with Infinity silk dome, in an attempt to have a less harsh sound. 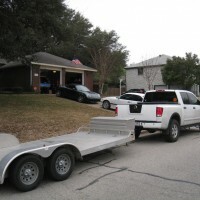 The pictures have not been updated, but the methods of installation still apply. 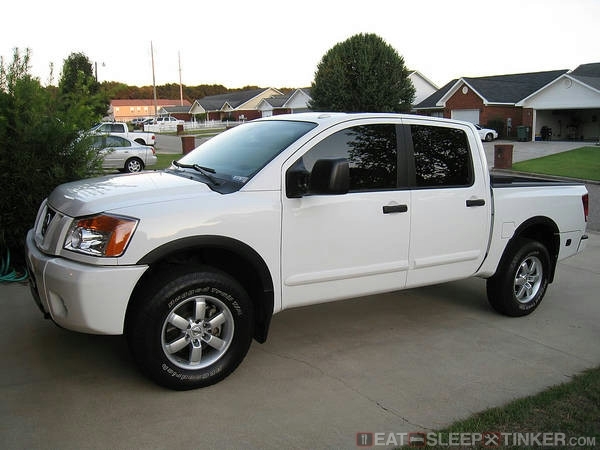 The factory tweets are located on the dash and the rear doors. The front tweet run off of a seperate channel directly from the RF OEM amplifier. The rear tweets are spliced into the rear channel inside the door and use an inline passive crossover. I wanted to retain as much of a factory look as possible, so the tweets would be mounted in their factory locations. 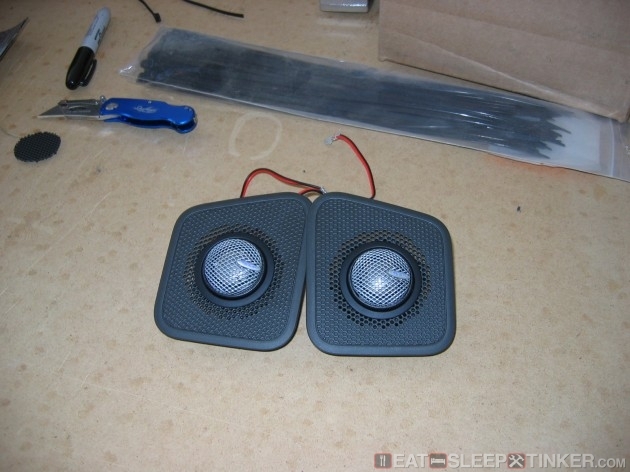 Like most aftermarket component speakers, these Infinity’s came with several mounting options. I chose to use the mount that sinks the majority of the tweeter below the mounting surface and has the ability to swivel or aim the speaker. Unlike the rest of the speaker installations, installing the tweeters is pretty easy without much fabrication involved. However, the OEM tweets are larger in diameter than aftermarket dome tweets, so a large hole is left once removed. To compensate for this I went the easy route and simply cut the proper size hole in the OEM tweeter grille using a Dremel tool. 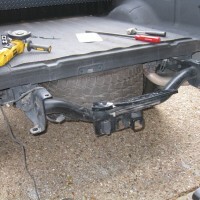 The same method was used for the rear tweeters as well. The rear doors have a small grille that easily pops out from the door panel. I removed all of the factory plastic material except for a small ring. The opening in the door also had to be clearanced slightly for the new tweeters. Here you can see how the tweets mount into the Infinity mounting system. 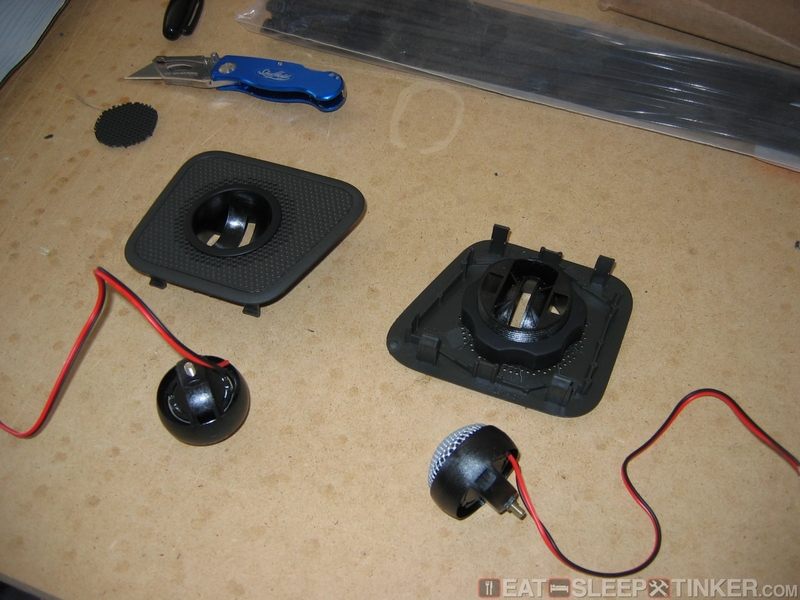 These are the two front tweeters installed into the OEM tweeter grilles ready to go in the truck. Since I’ve already covered the wiring, you can probably figure out how the install went. Like on the doors, I used HVAC aluminum tape to secure the wires inside the dash and rear doors. I used crimp on bullet connectors to make for easy installation/removal. I also reversed the male/female of the positive and negative connectors to insure the polarity wouldn’t be accidentally mixed up. Heat shrink was applied on all connections as well. This is the front left tweeter mounted in the truck. The swivel mount allows me to point the tweeter. 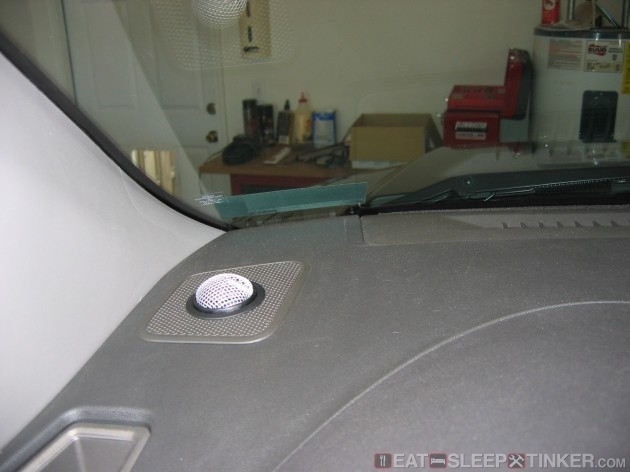 This is the left rear door tweeter mounted in the factory location. NOTE: I have recently decided to mount the dash tweeter below the factory grilles. I already have two new grilles, but have not found the time to relocate the tweets. I decided to do this to help give the truck a more factory look, as well as hide the tweets from thieves and the sun’s UV rays. I’ll be sure to update this once I finish and have photos.